Irish Course at Whistling Straits Hole 2: There aren't too many views of Lake Michigan on the Irish course, but the tee box on this shortish par four has one of them. However, the focus should be much more on the clear and present danger that the lake provides any shots going left. To the right, there are bunkers and more difficult angles to one of the more narrow greens on the course. Irish Course at Whistling Straits Hole 3: There are plenty of Pete Dye design items to worry about here: railroad ties, mounding, deep bunkers, and water near the green. This par three is pretty short, but the penalty for missing the green in any direction is fairly steep. Irish Course at Whistling Straits Hole 5: This dogleg right par five has a drive where cutting off / flying the big bunker is the biggest gamble / reward. That being said, the bunker is not deep and, as long as the mounding can be avoided, the risk is worth the shorter shot to the green from there. 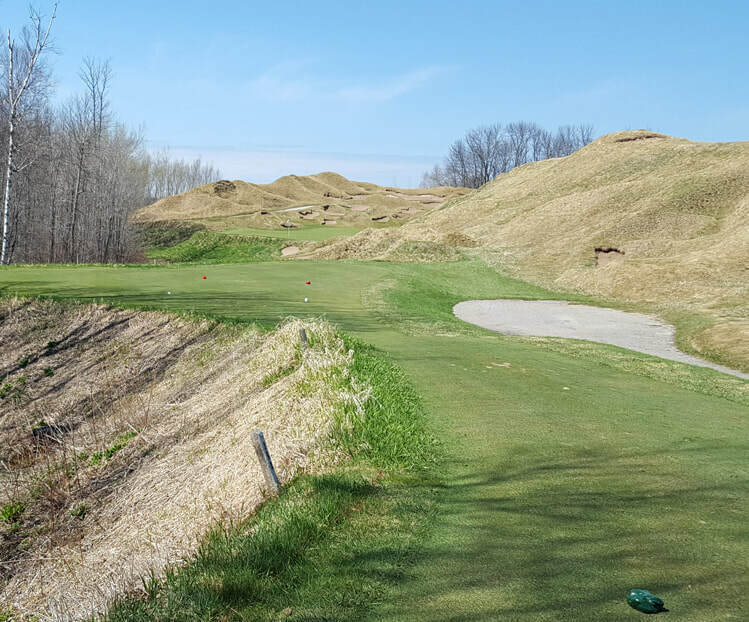 The creek that crosses the fairway on the second shot is more troubling and going left or right on the approach will leave a tough up and down. 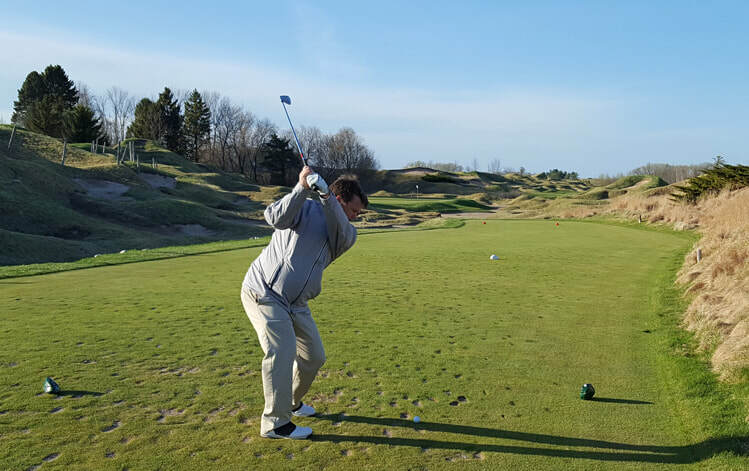 Irish Course at Whistling Straits Hole 6: The mounding and bunkering on this golf hole is among the prettiest on the property and the most reminiscent of the Straits course, just without any Lake views. Irish Course at Whistling Straits Hole 7: This par four is tough. Going right of the fairway or green will lead to a bogey or (likely) worse than that. However, the farther left off the tee one goes, the tougher the angle to the green, which has a well positioned and deep bunker just to it's left, which leaves less room for error from the left side. Irish Course at Whistling Straits Hole 8: Another dogleg right par five with a creek crossing on the second shot, this one is more undulating from tee to green and has slightly more danger, including a tough back pin location. 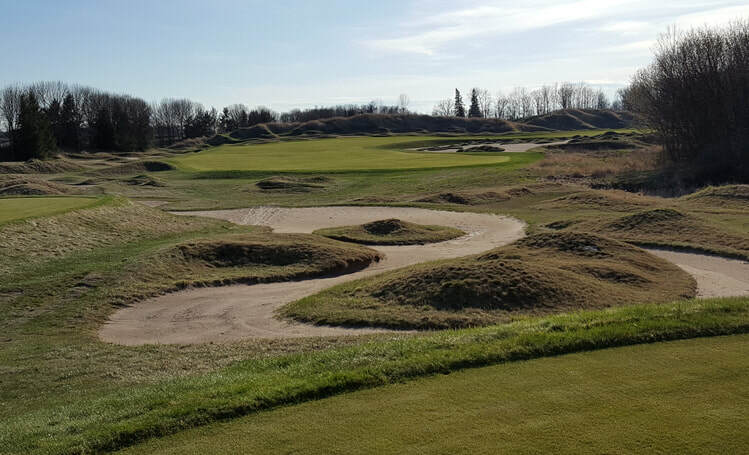 Irish Course at Whistling Straits Hole 11 (left): Avoiding the bunkers here is essential. The green is not wide, but is pretty deep so accuracy is more important than distancing; there is a bunker left on the dune that is so narrow and deep it looks life a coffin and, if the player ends up in there, it's no exaggeration to say there score is dead. Irish Course at Whistling Straits Hole 13 (below): The other par three on the back essentially is blind to any tee back of center, which is a little odd; however, the front pin is a good, tough shot, with nothing but trouble short or left. Shots right on the dune have a 50/50 shot of running back onto the putting surface. 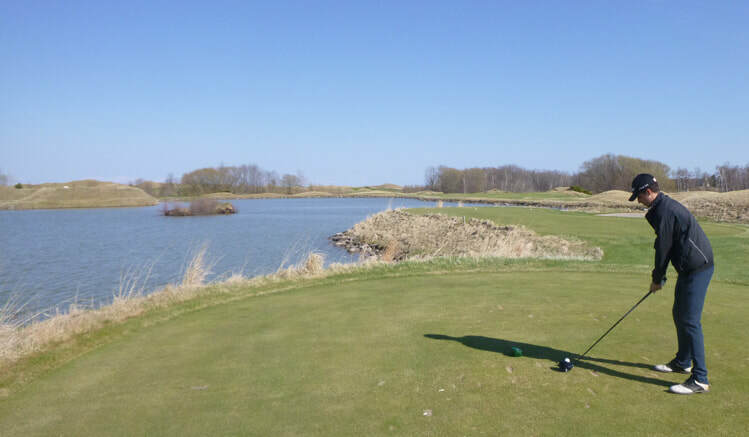 Irish Course at Whistling Straits Hole 14: This par five, once again, has a creek to cross on the second shot, but this one is more than easy to avoid and is much smaller than the others. The green is slightly uphill and has some interesting contours, running away from the golfer's approach from many angles. Irish Course at Whistling Straits Hole 15: This strong par four dogleg right par four has a tough, uphill drive that needs to avoid going right into the hazard, but the hole plays much shorter the closer to the trouble the golfer gets, without going in it. The hazard continues down the right, so being safe on the second shot is not a terrible choice, even if it means going for the front of the green. Irish Course at Whistling Straits Hole 17: This short par four is all about the water down the left. Of course, the player can't bail out too far right or they will find mounding, but even two short shots will leave plenty of room for success as long as they are on target. The green is nestled just behind the water and requires precision. Irish Course at Whistling Straits Hole 18: This is a love it or hate it par five. The water left must be avoided off the tee but going to far right will leave the second shot blocked by trees. 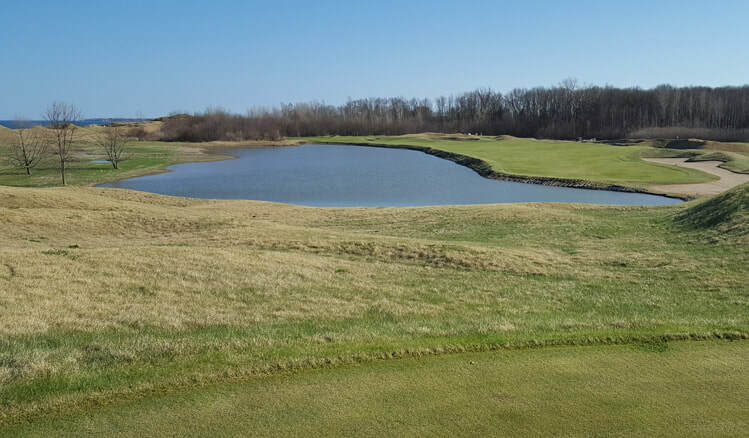 There is a creek, yet again, that can be crossed on the second shot, but two bombs are required to do so, to leave a wedge to the uphill green. If not done, then there is a tight layup second shot required to leave a much longer approach to the green, with the bunker to the left side being 20 feet below the putting surface, and so must be avoided at all costs.